Yesterday, after church, I noticed nearly a dozen children cheerfully surrounding an elderly lady. The kids weren't swarming over any other seniors in church, just this one lady. Being curious I slipped over to evaluate the phenomenon. This lady had no grand children of her own, but had a total grip on the small stampeding masses zipping around the pews. Sure enough, she had a purse full of candy and was "baiting" the kids. She was the most popular senior in the building, at least with the group that don't pay their own dental bills yet. The same thing works on Texas Longhorn cows. Cattle, like children, can be baited, tricked, coerced and manipulated with less sweat and muscle than the old John Wayne brute-force methods. It takes a plan, training and developing a method to achieve the goal. Some cattle are scared of a squeeze chute. The noise, the squeeze, the tight quarters, the slick floor that causes slipping and sliding, maybe all of the above. 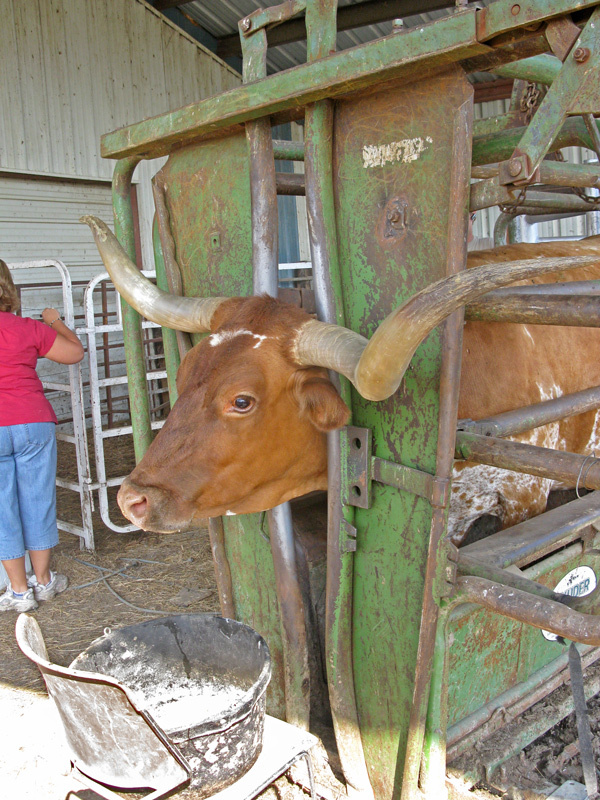 When valuable embryos are being extracted, the last thing needed is for a cow to lose-her-cool, lay down in a chute or start creating a wrestling event for the embryologist. One little trick helped the successful recovery of some valuable embryos. This cow had been a problem with all kinds of fear issues in the chute. A chair was placed in front of the head gate with a mix of sweet feed grain. She was loaded in the squeeze every day and fed prior to collection. The chute was opened wide to allow a spacious comfortable surrounding. Each day as she realized what joy it was to stand in the chute and eat her rations, she begin to look forward to it. On collection day she was waiting her time for a nutritious breakfast, and, as planned, all went well. Much of success when handling cattle is having a plan. Cattle are like children. When you go to church, or the cow pasture, take a purse full of "sweet feed." Everyone will love you!